Blue Surf Adventures, our sister company located here in Santa Teresa, offers a variety of Costa Rica surf lessons, Costa Rica surf camps, and Costa Rica surf retreats for all ages and skill levels. Are you a first time surfer looking for a fun and safe surf lesson, a beginner surfer looking to get back out on the water and ride a wave, or an experienced surfer looking to improve your skills? While staying at the Blue Surf House you can have it all- take a surf lesson in morning or afternoon (or both!) from our passionate and experienced surf instructors, sign up for one of our seven day surf camps, or try out one of our many surf retreats! Meet new friends from around the world, bond with family members, or have a great time with friends during a day out on the water. We believe that surfing is not only a sport but a lifestyle and attitude of peace, health, and pure joy. When in the ocean we believe you should have the utmost respect for Mother Nature and all she provides us with, while enjoying a fun and magical experience. Surf with us in the warm, tropical waters of Costa Rica and leave with memories that will last you and your family a lifetime! Blue Surf Adventures is extremely proud to be the only Billabong sponsored, upscale surf school and surf destination on the Nicoya Peninsula in Costa Rica! We provide all the gear you’ll need to have a great time out on the water, unless you prefer to bring your own. 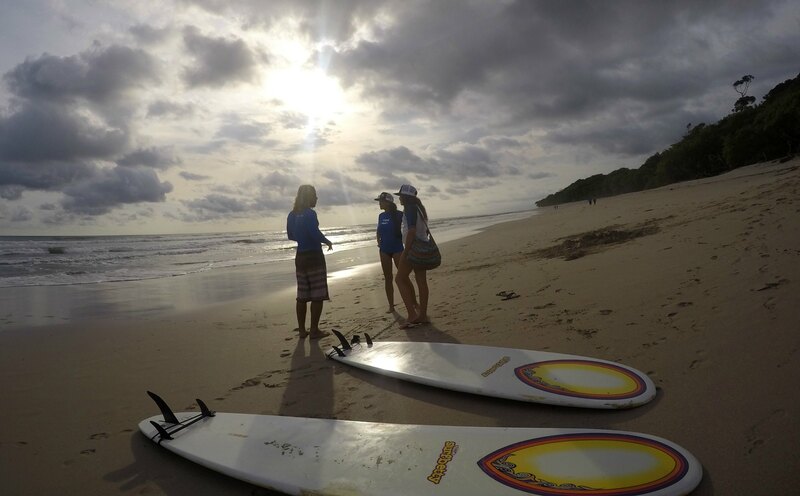 Our surf instructors will educate, guide, and help you every step of the way when taking a Costa Rica surf lesson or participating in a Costa Rica surf camp or surf retreat. We’ll provide you with all the necessary skills you need at every level. Our Costa Rica surf lessons are designed for any level of surfer, beginner to intermediate, to help improve your surf. We will help you progress your ability and take you to locations in the area that will be best for you current surf skill level. Our instructors will give you one-on-one attention and guidance based on your skill set and knowledge. Our lessons never exceed a 2 to 1 student to instructor ratio, allowing you to get the attention you need in order to improve your surf. Our Costa Rica surf camps are group experiences based around learning how to surf, surfing better, or finding a new awesome place to surf. We have several different themed surf camps that allow you to experience surfing in a group setting in a certain way or from a particular point of view. Our Costa Rica surf packages can be customized and built to be exactly what you want on your surf trip depending on your needs, wants, and desires. 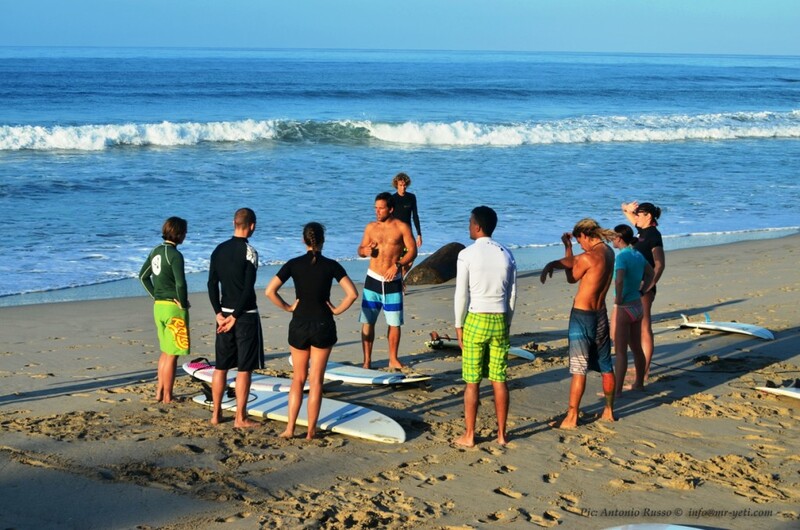 Most include two surf lessons daily with CPR certified instructors. Our Costa Rica surf retreats allow you to open your mind, body, and soul to find your inner Pura Vida. We offer our guests a replenishing retreat from the hustle and bustle of daily life, and a chance to restore balance and energy to the mind and body. The pure beauty of Santa Teresa, Costa Rica combined with daily surfing and yoga allows you the chance to unwind, escape, and refresh. Click here >> Blue Surf Adventures for more information on Camps, Retreats, and Lessons. Also you can book any of these service at the same time you book your accommodation at the Blue Surf House >> Book Now!